General principles and globally valid knowledge are essential to the progress of science and technology. However, globalization should not obscure the local origins of empirical knowledge and the necessity of particular factual information in practical applications of science. Empirical knowledge has local origins, being produced in particular homes, workplaces, or laboratories with their peculiar conditions. Practical applications of scientific principles require local conditions specific to the applications. Empirical sciences are able to partially transcend local bounds, abstract from local particularities, and discover general patterns that are globally applicable. Generalization and globalization are essential to the progress of science and technology. Local industrial conditions contributed to the emergence of chemical engineering in the United States rather than Germany. General principles developed by scientific engineers enabled them to adapt to changing environment and spawn new industry quickly in many parts of the world. All empirical knowledge originates locally, because human beings are not omnipresent God. Our experiences, our experiments, our corporal existences, are always rooted in particular geographical and historical localities with all their concrete peculiarities. Nevertheless, we can think in general and global terms, although each thinking person is particular and local. In systematic thinking about particular instances, abstracting from local peculiarities to uncover general patterns, science is born. However, no matter how high science flies, how much it abstracts, it must return to earth and take on local conditions if it is to make specific predictions in the real world. Herodotus remarked that geometry originated in Egypt from the practice of land measurement after annual inundation. That knowledge had its roots in living and working was avowed by Galileo, who observed that activities in the Venetian arsenal provided a fertile field for scientific investigation, especially the work involving mechanics. There, he wrote, “all types of instruments and machines are constantly being constructed by many artisans, among whom there must be some who . . . have become highly expert and clever in explanation.” To turn such local knowledge into science, however, other efforts are required. To Herodotus’ observation in Egypt, Aristotle added that the success of geometry also depended on the priestly class, who had the leisure to abstract from the specifics of surveying and uncover general geometric relations. While Galileo deemed artisans capable of explanation, he himself embarked on a systematic study in practical mechanics in his Two New Sciences, which many engineer historians regarded this as the beginning of structural analysis, the mathematical representation and design of building structures. General principles of geometry and mechanics have attracted most attention in the philosophy of science, partly because being clearly articulated and globally promulgated, they are more accessible than local practices that often go unrecorded. It may also be that philosophers appreciate the intellectual achievement of bridging local particularities and globally applicable principles. To discern general patterns that sweep across widely disparate local phenomena is difficult. To critically test pet generalizations against empirical instantiations is even harder. All too often people fall into the trap of reckless generalization. I tell you a story and then jump to a grandiose conclusion, such as “therefore God exists” or “therefore ‘nature’ is nothing but a social construction.” If you are not satisfied, I tell you more stories with more details. But how is the general conclusion supported by the particular details? What makes the local story a “case” of the grand doctrine? I can only ask you to use your imagination or take a leap of faith. 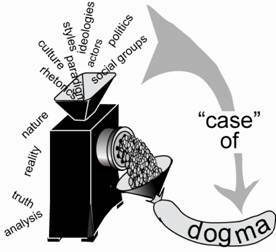 It is like making a sausage; one mixes up heterogeneous ingredients, stuff them into a casing labeled with a dogmatic sound byte, and sell it as a supported doctrine. Uncritical generalization leads to hype and dogma, not science. Humans can think in a whole spectrum of generality, from abstract logic to concrete sensual experiences. Academic disciplines such as history emphasize the details of particular incidences. Some generalizations are inevitable because historical narratives must use concepts, but the generalizations are so embedded and small in scope that historiography is poor in causal explanations and impotent in predictions. Attempts at grand generalization about the laws of history have yielded nothing fruitful. The ability of natural science and engineering to explain or predict specific phenomena rests heavily on their ability to connect the general and the particular. The connections usually involve many steps with various degrees of scope and detail. At the most general level are universal physical laws for fundamental mechanisms and interactions, for instance that of quantum mechanics and nuclear interactions. Narrowing the scope by specifying more details, we come to broad types of phenomenon: physicists study stars, which are nuclear fusion reactors in the sky, while engineers design nuclear fission reactors on earth. Narrowing further, smaller subtypes come into focus: a type of star called supernova or a type of meltdown-proof reactor called pebble-beds. Further details pinpoint a locality: the supernova SN 1987A or the pebble bed reactor being built in Koeberg, South Africa. Science and engineering do not jump from the general to the particular or vice versa. They zoom rigorously through many steps, each involves more abstraction or addition of details, each demands much effort. After Newton published the laws of motion and universal gravitation in 1687, it took the best mathematical minds and most diligent astronomical observers a century to work out, incompletely, the dynamics of the solar system. Sweating out such “local knowledge” always consumes the bulk of efforts in science and engineering. ● Chaos. Chaos is a mathematical theory, but it is popular enough to make its way into Hollywood movies. The butterfly effect – a butterfly fluttering its wing in Nicaragua can lead to a tornado in Texas – is a case of chaos. Interestingly, phenomena that exhibit chaos are similar to planetary motions in a fundamental way. Both are dynamic systems, governed by dynamic equations, and deterministic: a system’s state at one time uniquely determines its subsequent trajectory. Behaviors of deterministic systems are predictable in principle. Then why are chaotic systems, although deterministic, unpredictable? To predict the behavior of a particular system requires two pieces of information: its governing dynamic equation and an initial condition. It is in the sensitivity to initial conditions that chaotic systems differ from planetary motions. For chaotic systems, the slightest variation in initial conditions can lead to grossly divergent trajectories. Thus unless the initial condition is specified absolutely exactly, which is quite beyond human capability, the behavior of a chaotic system is unpredictable in practice. The dynamic equation, which governs many systems, can be regarded as global knowledge; the initial condition, specific to the system at issue, local knowledge. The former often eclipses the latter in philosophical discourse. Chaos, in clear mathematic terms, brings to relief the importance of local knowledge. ● The Washington Consensus. What happen when local conditions are neglected? Let us look at two application of the Washington Consensus. The Washington Consensus is a set of economic crisis management rules constructed by mainstream academic economists and high officials in the United States government and the International Monetary Fund. Its central idea about free markets may be generally sound, and many of its prescriptions are supported by scientific papers. Unfortunately, they were sometimes imposed on troubled national economies without regard to local conditions, resulting in amplified crises and intensified suffering of local people. When Boris Yeltsin decided to turn Russia into a market economy in 1992, he adopted the Washington Consensus and appointed western advisers to top positions. Over almost unanimous objection of Russian economists familiar with local conditions, Yeltsin accepted the Washington Consensus’ prescription of “shock therapy,” in which all reforms were to be implemented immediately. A central dogma of the Consensus was for the government to withdraw from economic affairs and let the free market get things right. It might well work in nations such as the U.S.A, which has a vibrant private sector with strong market-oriented institutions. In 1992 Russia, however, the private sector was so weak the market hardly existed. Once the government withdrew, the whole economy collapsed and for many years the Russian people deeply suffered. Similarly, the 1997 Asian financial crisis was much worsened by the Washington Consensus, which prescribed rules designed to curb government profligacy, not noticing that the major culprit of this particular crisis was not governments but private sectors, which incurred unbridled debt. The wrong policies brought deep recessions in several countries, turned a financial crisis into a full blown crisis of the real economies. ● Engineering efficiencies: The two preceding examples show the necessity of local knowledge, the third its insufficiency. Manufacturing is generally more efficient than construction, which is why prefabricated parts for buildings become increasingly popular. One reason for the difference in efficiencies is that factories are movable and many factors in manufacturing processes can be abstracted from local conditions. For instance, the just-in-time supply chain developed in Japan can be adopted in Europe and America. Thus industrial engineers can accumulate knowledge acquired in disparate practices, rationalize and improve manufacturing methods systematically. Constructions, in contrast, are tied to the peculiarities of specific construction sites. The efficient logistics developed for building the Hoover Dam would not be readily adaptable for building dams in Africa because the local conditions are so different. Of course, civil engineers can devise ways to utilize local resources efficiently, but they have to do it for each construction site separately. To develop effective processes for complex tasks is expensive. The ability to abstract from local specifics and apply the acquired knowledge in different situations encourages sharing of development costs, facilitates knowledge accumulation, and furthers technological progress. This huge advantage is lost to a culture closed upon itself. This leads us to my main example. In the nineteenth century, the approach of industrial chemists to chemical production was similar to construction – one process at a time, separately, individually, as if each process is incommensurate with all others. Chemical engineering introduced scientific principles that enabled them to generalize on particular practices and rationalize production processes in the manner of manufacturing. Engineering has many branches, each tending to a distinctive type of technology: civil, mechanical, chemical, industrial, electrical and electronic, aeronautic and aerospace, computer, biological, and more. Civil and mechanical, the two oldest branches, have deep roots in practical arts. The younger branches tend to co-evolve with modern science and technology. graduate school, industrial research laboratory. I prefer to be more down to earth and explore the mutual impacts between chemical engineering and American industrial structures and academic institutions. Why did chemical engineering emerge in America instead of Germany? Second part: Why did chemical engineering emerge in America instead of Germany?